Like many of our Bruins, former alumni Steven Laub embodies the traits of passion, determination, and resilience. These are the very same traits that shaped his illustrious career as a former consultant and top executive at numerous public semiconductor companies such as Lattice Semiconductor, Silicon Image and until recently, the Atmel Corporation where Laub served as President and CEO for a decade. 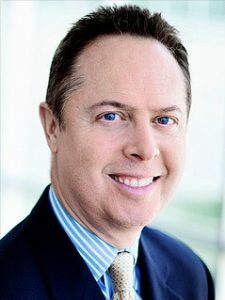 Unlike many UCLA graduates, what makes Laub’s story unique was his background and unusual foray into the technology industry. Upon graduating UCLA in 1980 with a B.A. in Economics, a subject that captivated him since junior high, Laub attended the Harvard Law School to pursue his initial career interest in the field of law. It took him two years, however, to realize that this was not his true calling and immediately after graduating, he switched gears and began to work as a management consultant for Bain and Company. When pressed why, Laub recalled how management consulting allowed him to gain exposure to a multitude of industries while picking up vital skills along the way, which he best described as “almost like acquiring an MBA education without going to business school”. Without question, this exposure certainly paid off. After having several technology companies including a few semiconductor firms as consulting clients, he was offered a job with Lattice Semiconductor Corporation. The young consultant initially turned down the offer, only to later be offered the position as Vice President and General Manager at the same company. He knew if there was ever an opportunity to get involved in the tech business world, this was it. Although it is highly unusual for someone with a non-technical background to head a technology-based firm, this notion never impeded Steven Laub. When his CEO sought to hire him, the company’s board of directors questioned why a man with a legal background and no prior engineering or technological experience was a good fit for the role of a VP at a semiconductor company. His CEO replied by describing Laub as highly intelligent, ambitious and willing to work very hard – an identity that Laub believes fits several of our Bruins. He believes that individuals who are passionate and determined to work hard will attract mentors and be given the opportunity to do more. Working to forge these relationships are of the utmost importance. That said, even with valiance and an excellent work ethic, his transition into the industry was not one of ease. Despite not being acclimatized to the technology sector, early on he was advised to spend two thirds of his first two years at the company in the engineering division. He attributes his sudden immersion in the engineering department as a key part in overcoming the steep learning curve ahead of him. Although this may seem radical, Laub believes that this is one of the most efficient ways to assimilate into new career environments; by working in the departments or roles that push you out of your comfort zone and force you to think. The qualities that Laub possesses which have enabled him to achieve his tremendous degree of accomplishments are similar to those he looks for in hiring individuals. Aside from being effective team players, Laub looks for people that are capable of putting the needs and goals of the firm ahead of themselves. Most importantly, high integrity and character are absolutely necessary to succeed at every company he has led. He contends that truly passionate individuals who are hungry to accomplish goals for the greater good will leave a mark. Given his success, it is easy to see that Laub was comfortable in not allowing his degree to solely determine the trajectory of his career. However, several students face the overwhelming concern of how important their major is in determining their career opportunities. Laub contends that most students either enter college not knowing what major to pursue or they pursue a major in order to break into an industry they envision themselves working in. He says that while picking a best fit major is important, it is by no means the only determinant of your future career – especially since many people, including himself, end up changing their careers at some point. Due to the manner in which UCLA influenced his career, Laub would not have done much differently. He received what he believes to be an outstanding education at UCLA under the tutelage of notable professors like John Riley of the UCLA Economics Department. Despite an engaging and rewarding academic experience, Laub looks back and believes that he could have involved himself more in the breadth of courses and events UCLA offered, especially in the theatre and arts. Although back then he had little desire for those areas, he reflects upon it conceding that with age grows an appreciation for such forms of creative expression. These days, what initially motivated Mr. Laub to wake up every morning remains the same. He lives for challenge, the opportunity to learn and the chance to give back to his communities. While the stresses of running firms and managing people can seem unappealing to some, these are aspects he thoroughly enjoys. Far from having retired, he continues to challenge himself and to advise others. Laub currently serves on the board of a semiconductor company, the advisory board of a tech-focused private equity company and the board of a public charter high school in the Bay Area. He is now at a point in his life where he can focus on giving back and aiding others with his wisdom. Mr. Laub leaves us with advice regarding tackling change – a topic all too familiar for him. Most people will graduate, find a career, realize it is not their passion and will have to confront the possibility of a change. Mr. Laub adds that by taking ownership of your actions and finding the courage to make life-changing decisions, you open yourself to a potentially better path. One might have a steady income, a marriage to sustain and a family to support, so change will not come easily. However, the Bruin champions the belief that “having the courage to live the life you desire” will make the ultimate difference.